This example shows how to use a Simulink model to generate fault and healthy data. The fault and healthy data is used to develop a condition monitoring algorithm. The example uses a transmission system and models a gear tooth fault, a sensor drift fault and shaft wear fault. The transmission casing model uses Simscape Driveline blocks to model a simple transmission system. The transmission system consists of a torque drive, drive shaft, clutch, and high and low gears connected to an output shaft. The transmission system includes a vibration sensor that is monitoring casing vibrations. The casing model translates the shaft angular displacement to a linear displacement on the casing. The casing is modelled as a mass spring damper system and the vibration (casing acceleration) is measured from the casing. The transmission system includes fault models for vibration sensor drift, gear tooth fault, and shaft wear. The sensor drift fault is easily modeled by introducing an offset in the sensor model. The offset is controlled by the model variable SDrift, note that SDrift=0 implies no sensor fault. The shaft wear fault is modeled by a variant subsystem. 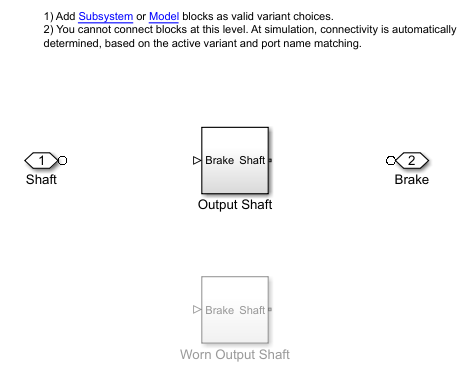 In this case the subsystem variants change the shaft damping but the variant subsystem could be used to completely change the shaft model implementation. The selected variant is controlled by the model variable ShaftWear, note that ShaftWear=0 implies no shaft fault. The gear tooth fault is modelled by injecting a disturbance torque at a fixed position in the rotation of the drive shaft. The shaft position is measured in radians and when the shaft position is within a small window around 0 a disturbance force is applied to the shaft. The magnitude of the disturbance is controlled by the model variable ToothFaultGain, note that ToothFaultGain=0 implies no gear tooth fault. The transmission model is configured with variables that control the presence and severity of the three different fault types, sensor drift, gear tooth, and shaft wear. 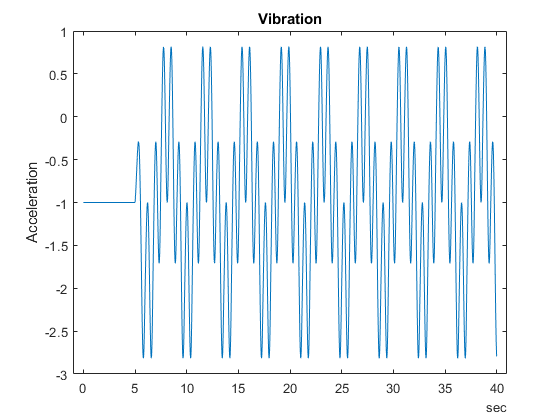 By varying the model variables, SDrift, ToothFaultGain, and ShaftWear, you can create vibration data for the different fault types. Use an array of Simulink.SimulationInput objects to define a number of different simulation scenarios. For example, choose an array of values for each of the model variables and then use the ndgrid function to create a Simulink.SimulationInput for each combination of model variable values. Similarly create combinations of random values for each model variable. Make sure to include the 0 value so that there are combinations where only subsets of the three fault types are represented. With the array of Simulink.SimulationInput objects defined use the generateSimulationEnsemble function to run the simulations. The generateSimulationEnsemble function configures the model to save logged data to file, use the timetable format for signal logging and store the Simulink.SimulationInput objects in the saved file. The generateSimulationEnsemble function returns a status flag indicating whether the simulation completed successfully. The code above created 110 simulation inputs from the gridded variable values and 98 simulation inputs from the random variable values giving 208 total simulations. Running these 208 simulations in parallel takes around ten minutes on a standard desktop and generates around 10GB of data, an option to only run the first 10 simulations is provided for convenience. The generateSimulationEnsemble ran and logged the simulation results. Create a simulation ensemble to process and analyze the simulation results using the simulationEnsembleDatastore command. The simulationEnsembleDatastore command created an ensemble object that points to the simulation results. Use the ensemble object to prepare and analyze the data in each member of the ensemble. The ensemble object lists the data variables in the ensemble and by default all the variables are selected for reading. For analysis only read the Vibration and Tacho signals and the Simulink.SimulationInput. The Simulink.SimulationInput has the model variable values used for simulation and is used to create fault labels for the ensemble members. Use the ensemble read command to get the ensemble member data. 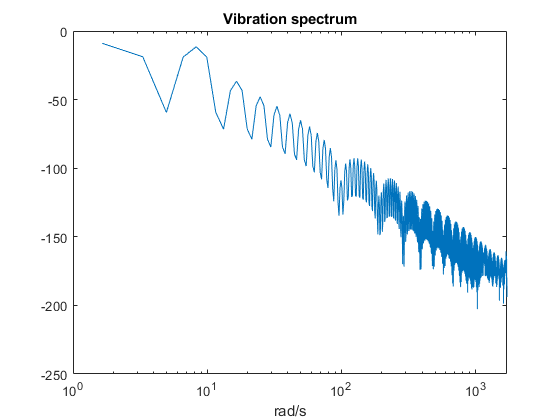 Extract the vibration signal from the returned data and plot it. The first 10 seconds of the simulation contains data where the transmission system is starting up; for analysis discard this data. The Tacho signal contains pulses for the rotations of the drive and load shafts but analysis, and specifically time synchronous averaging, requires the times of shaft rotations. 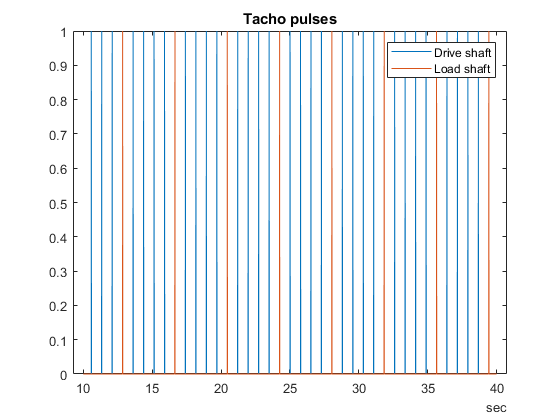 The following code discards the first 10 seconds of the Tacho data and finds the shaft rotation times in tachoPulses. The Simulink.SimulationInput.Variables property contains the values of the fault parameters used for the simulation, these values allow us to create fault labels for each ensemble member. The processed vibration and tacho signals and the fault labels are added to the ensemble to be used later. The ensemble ConditionVariables property can be used to identify the variables in the ensemble that contain condition or fault label data. Set the property to contain the newly created fault labels. The code above was used to process one member of the ensemble. To process all the ensemble members the code above was converted to the function prepareData and using the ensemble hasdata command a loop is used to apply prepareData to all the ensemble members. The ensemble members can be processed in parallel by partitioning the ensemble and processing the ensemble partitions in parallel. 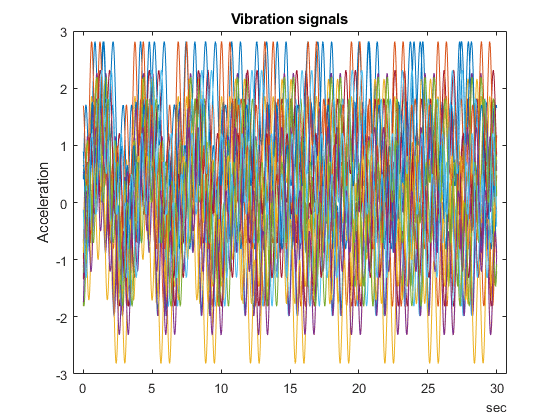 Plot the vibration signal of every 10th member of the ensemble using the hasdata and read commands to extract the vibration signal. Now that the data has been cleaned and pre-processed the data is ready for extracting features to determine the features to use to classify the different faults types. First configure the ensemble so that it only returns the processed data. For each member in the ensemble compute a number of time and spectrum based features. 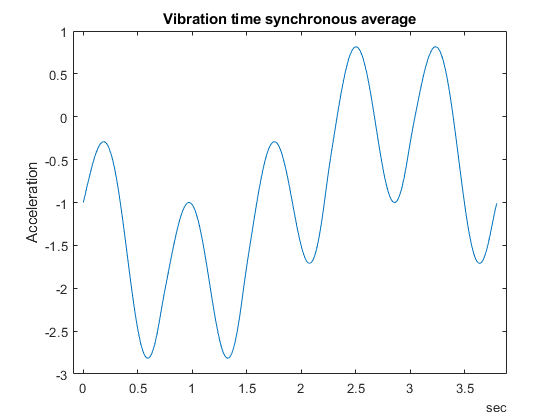 These include signal statistics such as signal mean, variance, peak to peak, non-linear signal characteristics such as approximate entropy and Lyapunov exponent, and spectral features such as the peak frequency of the time synchronous average of the vibration signal, and the power of the time synchronous average envelope signal. The analyzeData function contains a full list of the extracted features. By way of example consider computing the spectrum of the time synchronous averaged vibration signal. The frequency that corresponds to the peak magnitude could turn out to be a feature that is useful for classifying the different fault types. The code below computes the features mentioned above for all the ensemble members (running this analysis make take around thirty minutes on a standard desktop, optional code to run the analysis in parallel using the ensemble partition command is provided). The names of the features are added to the ensemble data variables property before calling writeToLastMemberRead to add the computed features to each ensemble member. The features computed above are used to build a classifier to classify the different fault conditions. First configure the ensemble to read only the derived features and the fault labels. Gather the feature data for all the ensemble members into one table. Consider the sensor drift fault. Use the fscnca command with all the features computed above as predictors and the sensor drift fault label (a true false value) as the response. The fscnca command returns weights for each feature and features with higher weights have higher importance in predicting the response. For the sensor drift fault the weights indicate that two features are significant predictors (the signal cumulative sum range and the peak frequency of the spectral kurtosis) and the remaining features have little impact. A grouped histogram of the cumulative sum range gives us insight into why this feature is a significant predictor for the sensor drift fault. 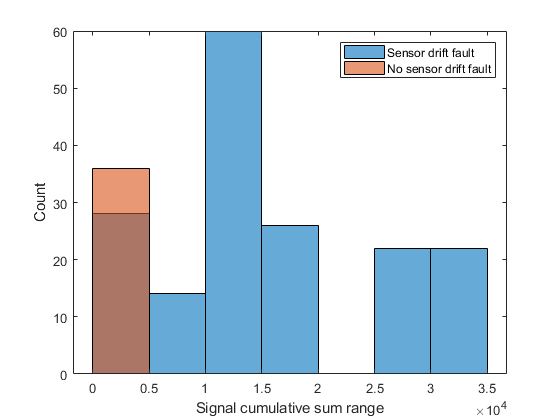 The histogram plot shows that the signal cumulative sum range is a good featured for detecting sensor drift faults though an additional feature is probably needed as there may be false positives when the signal cumulative sum range is below 0.5 if just the signal cumulative sum range is used to classify sensor drift. Consider the shaft wear fault. In this case the fscnca function indicates that there are 3 features that are significant predictors for the fault (the signal Lyapunov exponent, peak frequency, and the peak frequency in the spectral kurtosis), choose these to classify the shaft wear fault. The grouped histogram for the signal Lyapunov exponent shows why that feature alone is not a good predictor. 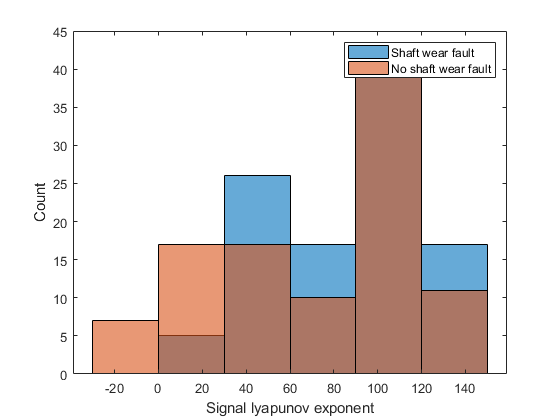 The shaft wear feature selection indicates multiple features are needed to classify the shaft wear fault, the grouped histogram confirms this as the most significant feature (in this case the Lyapunov exponent) has a similar distribution for both faulty and fault free scenarios indicating that more features are needed to correctly classify this fault. Finally consider the tooth fault, the fscnca function indicates that there are 3 features primary that are significant predictors for the fault (the signal cumulative sum range, the signal Lyapunov exponent and the peak frequency in the spectral kurtosis). 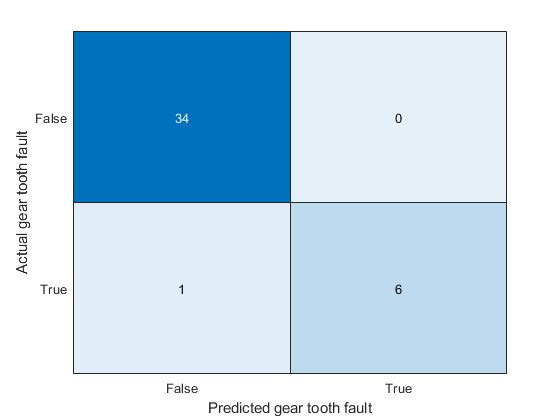 Choosing those 3 features to classify the tooth fault results in a classifier that has poor performance. Instead, use the 6 most important features. 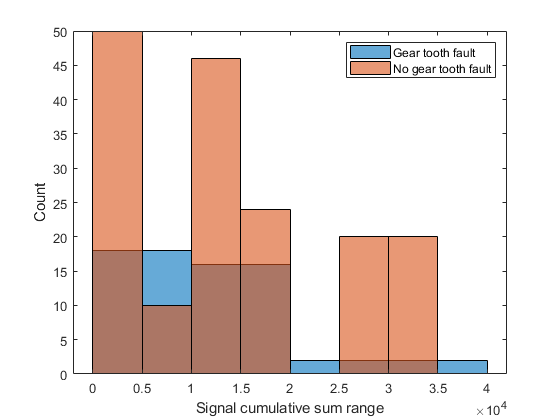 Using the above results a polynomial svm to classify gear tooth faults. Split the feature table into members that are used for training and members for testing and validation. Use the training members to create a svm classifier using the fitcsvm command. Use the classifier to classify the test points using the predict command and check the performance of the predictions using a confusion matrix. The confusion matrix indicates that the classifier correctly classifies all non-fault conditions but incorrectly classifies one expected fault condition as not being a fault. 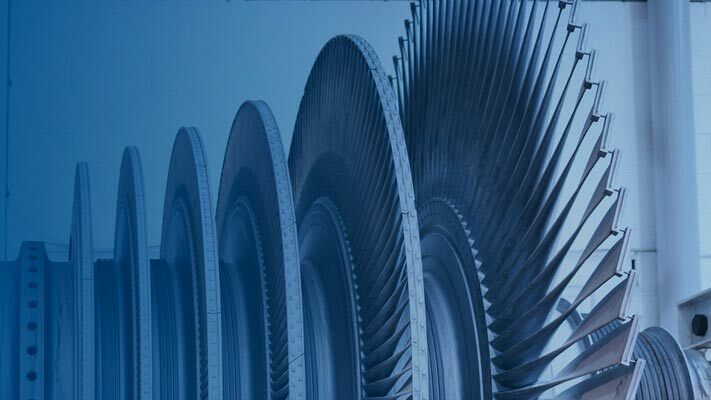 Increasing the number of features used in the classifier can help improve the performance further. This example walked through the workflow for generating fault data from Simulink, using a simulation ensemble to clean up the simulation data and extract features. The extracted features were then used to build classifiers for the different fault types.